GIVEAWAY: Scroll to the end of this post for a chance to win a copy of this book. Pages: 322 (275 color images, 57 black & white images, spot varnish). Interactive components: 1 lift-up flap, 1 internal cutout, 1 pop-up, a 5-page color foldout, a 15-panel color foldout in an envelope. “A project five years in the making,” wrote Clay Evans in his review for the Boulder Camera, “Collen’s slick, clever, refreshingly unpredictable labor of love is like no other book you’re likely to read any time soon.” A bit more descriptive, Sara Davidson, novelist, TV producer, and New York Times best-selling author says STORM OF THE i: An Artobiography is “a fabulous hybrid, a memoir that’s alive with foldouts, paintings, drawings, a surprising lift-up flap and even a pop-up that hands the reader a fortune cookie with a message inside. How do I even begin to describe a book so unique, I have never seen anything like it before? I loved this book. It feeds all my senses. My sense of curiosity, my sense of yearning for the visual and my sense of rhythm for the written word. When I get a new book the very first thing I do is to fan through the pages whether it has illustrations or not. When you do this you get a good whiff of that new book smell, you know? I don’t know about you, but it just puts me in the mood. When I did that with this book, when I bent the pages and let them flap open, it immediately sucked me in! It didn’t riffle smoothly like other books. The pages are different thicknesses, the pages were full of color. There were inserts, there were pop outs, fold outs, cut outs, you name it. There were paintings, drawings, photography, sketches, scribbles and everything else that you would find cluttering up one’s life. Before I even read a work of text, I was already immersed in this book. You know how it feels when you enter someone’s house without their knowledge and you start looking through their stuff and opening drawers and closets and stuff? Well, maybe you don’t know how it feels. I’m not in the habit of doing that either. lol! But if I were, if I let loose the total voyeaur in in me and just be as nosy as can be, the things in the Strom of i will be the things that I would be looking for. 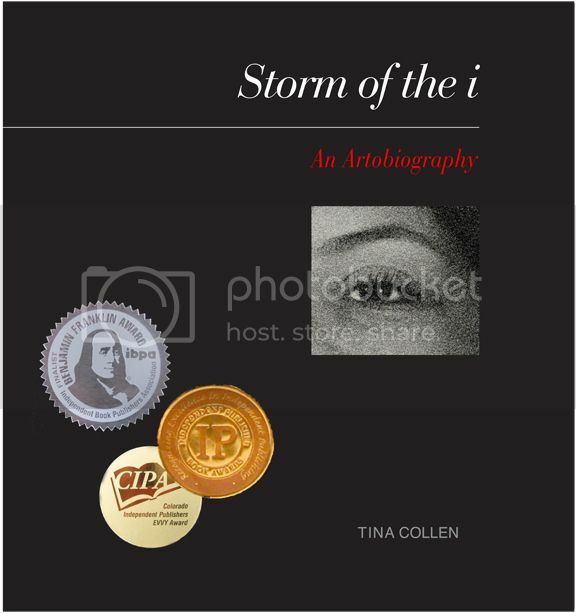 When I started reading this book and looking through the memorabilia, it felt like I had walked into Tina Collen’s life. I was in her house opening drawers and browsing in closets. I almost felt guilty being privvy to the things I was looking at and reading about. But instead of turning away, she pulls you in. She pulls you in with her stories of her father, her husband, her family, herself. She talks about everything. You feel like her best friend by the time you’re done reading this book. You feel like calling her up and chatting like old friends do about the old times. This is one of those books where when you’re done reading, you want to go back and go through it all over again. That’s where I’m at now. And the amazing thing is, when you look at all the things inside this book, you realize some of the things unsaid in the story and you see bits and pieces of yourself among the keepsakes. This is the scrapbook/memoir that most of us could only dream of making for ourselves. But before you go pulling all your junk and putting them in a book like she did, you might want to look deeper within first like she had to do. She found the story within, conquered it and pasted it up in the Storm of i. If you’d like to see a bit more about how Artobiography came into existence click here. The next stop on Tina’s blog tour is Sandra’s Book Club at http://sandrasbookclub.blogspot.com/. Oftentimes the objects we hold onto contain cryptic clues that point towards something deeper about ourselves. Take a look around your house (or your room) at the things with which you have surrounded yourself. Is there anything you are still hanging onto that seems to contain a hidden message for you? What do you think it is? This giveaway will end at the end of the blog tour on February 11. For more chances to win, visit these other blogs on the tour and tell them your story. Disclosure: I received a free copy of this book for this candid review. No other compensation was received. Pingback: AMoores » Win the Storm of i! Very nicely done; and i like your blog! In answer to the question, I have a small piece of paper I carry with me at all times. On the day my ex died I wrote a small note telling him how much he was loved and that he would be missed. I signed this note with the names of our two sons. If found by anyone they would never know the note is my heart. Although I do not look at it often I know it is there and rely on it to get me through the tougher times in my life as it reminds me that love truly does exist. Thank you so much for your generous review. I always take a risk when I put my life (my memoir) in someone’s hands … and I feel that you have handled it with great care. Thank you, thank you.